83 Responses to Don’t Know How Many Heartbeats Per Minute Your Baby Is Beating? Shame on You! Like almost all other “safety” items targeted at parents there are children who have medical conditions that would benefit from this. Also like almost every “safety” item targeted at parents those who truly need it already had access to it through the medical providers treating those conditions. Jenny, I read that between the lines too. Geez and I thought my friend was crazy for buying a baby monitor with an under-the-mattress movement sensor. This is much worse! Sounds like a great idea…for kids who should be in hospital. For kids at home, not so much. Do the e-mails also include the FART and BURP updates as well? Babies need love, not worry! Rock them, sing to them, dance them around, but put the f-in cellphone down! Don’t worry, baby, Robot Mama is here to love you. “MD+DI’s Brian Buntz reported: At last week’s Burrill Digital Health Meeting in Burlingame, CA, many believed new technologies will be swift, disruptive, and will alter the face of healthcare. I love the way it says the device does all the work. I didn’t see where it changes poopy diapers and does nighttime feedings. But they do have machines nowadays to monitor kids who are at risk. That’s nothing new. I could see some geeky parents getting this just to have fun with it. And then wishing they hadn’t. I actually had a heart monitor for my son, because when he came home from the hospital he was still a bit shaky on his breathing and was on oxygen for 3 months at home. (He was born at 26 weeks.) It did catch the oxygen come off a couple of times, but most of the alarms were due to the sensor belt slipping. How annoying would that be? Baby moves at 1:00am, heart rate goes up, Bzzzzp, Exmobaby goes off, baby settles down, heart rate goes down, Bzzzzp. Puh-leez! Jenny – exactly. I’m going to be a first-time mom in a few months, and like all new mothers, I’m sure I’m going to be up half the night making sure my baby is still breathing, and feeling absolutely silly about it afterwards. But if there IS an upside to that needless worry and desire to hover, it’s that it provides extra bonding time between parent and child – listening to your baby breathing, touching them, feeling that tiny heartbeat, letting them smell your scent as they sleep. Replacing that traditional crib vigil with a monitor and texts seems like the worst of both worlds – all the worry and stress, none of the extra time with your baby! SIDS is terribly sad, but as Heather and Matt point out, if you have a baby at known (or potential?) risk, you will be provided with appropriate equipment by the medical types. What about electrical charges travelling through a baby’s clothing? Is that really safe? I confess to complete ignorance of electronics, sadly (it took me months to understand how that test where you hook a lightbulb up to a circuit works 🙁 ), but is it really a good idea to have random circuitry attached to a healthy baby anyway? As Heather said there are babies with medical conditions that could benefit from this (e.g. be able to be cared for at home as opposed to in hospital) but for the majority of parents it’s not a necessary or, really, useful. I also agree with Jenny on the “less time paying attention to the child, more time watching a cell phone” message. Parents want to be the best at raising kids for the sake of being the best at parenting not for the sake of giving the child the best childhood. I wonder how much of this comes from the constant pushing of motherhood as a job? How often these days is being a mother described as a “full-time job” or “the toughest job in the world” or something similar. Seems like it might have had an impact on the way people view raising kids at some point. Previous generations called being a parent hard work but they didn’t refer to it as a job. Job brings with it connotations of competing with other people doing the same job and finding ways to measure your progress and show others how well your are doing. Thus an iPhone app that allows you to track how often your baby does x and compare to how often other babies do x and rank your baby against those other babies becomes hugely popular. Oh, and more on topic, I asked a friend of mine who lost her second son to SIDS (and happens to be a doctor) if she would have used this gadget suit on her asthmatic daughter, born after their son died, when she was a baby if it had been available then. My friend said no, she wouldn’t have, she thinks it would only be useful for babies with complex medical needs. She did use a movement sensor with her daughter and felt anything above that would be overkill and, if anything, have caused her to worry more. Our first child was born earlier than anticipated & had one of those when he was in his little isolette in the NICU, he also had a feeding tube, & a team of highly-trained around-the-clock nurses to keep an eye on him. He never had any breathing problems (except when he’d scream himself purple, but then he’d stop & gasp for air) or heart problems. He also didn’t let us put him down long enough to worry about such things b/c he was awake & wanted to see everything ALL THE TIME. Just one more technological gizmo to undermine people’s ability to trust their instincts and know their babies. Babies don’t need a robot monitoring every breath, heartbeat and gurgle – they respond to another warm body. This is what should be proposed – warm bodies with regular breathing to help pace baby’s breathing. A good one would be the one they lived inside of for the previous nine months. Side benefit to this awesome technology? Better sleep, more frequent but less disruptive sleep interruptions, better feeding habits, and more rested mom. It’s a wonder that we survived to this age of technology. This thing is ridiculously expensive, you only get one “garment” in the kit, and if your child is like most, it will spit up on it within and hour and you’ll have to change their clothes and won’t be able to monitor them anyway. This would make sense if your child has a medical condition, but is extreme overkill for most situations. When I was a pediatrics resident the science did not support using medical grade monitoring equipment for neonatal apnea or bradycardia. There was not sufficient evidence that it was useful. To my knowledge there is no difference in SIDS outcome between monitored and unmonitored babies. Maybe things have changed in the years since (I’m a specialist now and don’t keep up so closely on such things), but I kind of doubt it. And I sincerely doubt that non-medical grade equipment intended for the average person to purchase would be useful at all. Thankfully I suspect such a product will produce so many false positive events that most sane parents would get frustrated by it and stop using it. The insane parents on the other hand… will be driving their pediatricians nuts with all this new “useful” info. Home monitoring I should say. Obviously in the ICU we monitor patients, but that’s a whole other ball of wax. *Snerk* Whatever happened to instinct? I’m 8 months pregnant and so far we haven’t got a baby monitor and at this stage probably won’t. If we do it will only be so that I can be gardening at the bottom of the section and know when the baby wakes up. We live up a hill from a busy road so we get a lot of road noise and I would only hear big screams otherwise. It’s bad enough that people are buying/hiring dopplers to monitor fetal heart, this is ridiculous. I can see the usefulness of this for a parent who has lost a baby to SIDS. One of my dearest friends just lost a baby last week to SIDS and I think something like that might make her feel safer with a future baby during the night. Regardless of the real “need” for such a thing. However, for most babies this seems rather absurd, especially during the day when you should be aware of what is going on anyhow. I decided to go check out the website, mostly to see how different it is from the non-wearable type of sleep monitor, like the Angelcare. (Answer: pretty different, and a lot more thorough/paranoia-inducing.) It’s still being tested, and isn’t available to the general public yet, but they do intend to market it to first-time parents of perfectly healthy children. Q: I like Exmobaby vital sign monitoring technology but I am afraid of any kind of radiation whatsoever. What do I do? A: Exmovere is working on a non-wireless version of Exmobaby that merely displays the data on the garment using woven fiber-optic displays. This would eliminate the need for wireless transmission but would still require someone to actually look at the baby itself. Well, that’s awfully inconvenient. I wouldn’t want to actually have to look at my child. Also, most kids have a built-in monitor to let you know when they need something. It’s called yelling at the top of their little lungs. Best part–it’s free! Great, something else to fuel the paranoid moms. How about we get a device that monitors the moms? Every time they get worked up about some stupid non-danger, they are automatically injected with valium so they can just chill out. Robert, I was wondering if that was the case. Haven’t they come to the conclusion that most babies who die of SIDS actually have some undiagnosed medical problem? How much power do we actually have to save them? …but wouldn’t this type of parent then also worry about the potential radiation exposure from the wireless transmissions coming from the onesie? …and what about the potential shock hazard if baby spits up while wearing a bodysuit that obviously has a power source? Right after my daughter was born, I took her to my cousin’s house, whose daughter was two years old. She had one of those video monitors, and when she put her little one down for a nap, she sat and watched it the rest of our visit. I asked her, “How do you even sleep? I would get obsessed with that thing.” She replied, “I haven’t really slept much since she was born.” I refused to use a monitor after that! The girl was TWO! How did the human race survive without all this “space age” technology? I use the term “space age” deliberately–my daughters grew up during the 60’s and 70’s, when the people most likely to have vital signs “telemetered” were astronauts. I can’t imagine stressing myself out so much with that kind of a gadget, and that includes when my youngest (6 months old at the time) was diagnosed with parapertussis, and had horrendous coughing spells for weeks on end. Moved her into my room, sure, and had some really sleepless nights, but I think that was a much better way to handle things at the time it was needed. If so much monitoring is needed, I’d think being close would matter too. I can be paranoid without the extra tools to help, thanks. If are up half the night, it’s not going to be because you’re sitting there calmly, watching your baby sleep. Whoo-hoo, I was hoping they would invent something that would allow me to “supervise” my child from afar. Now I can run to the corner store or visit with my neighbor without getting a sitter. I love technology. For the record, my children are all big kids and the above in in complete jest. Oh, and to reinforce what others said about the product; this sounds like a great idea – for people who HATE TO SLEEP! Have the people who came up with the latest useless gizmo ever actually had a newborn baby at home? You’re being woken often enough as it is without needing a text or email letting you know every time your baby moves in her sleep. And when do we get to the point where people decide that all SIDS deaths are preventable if you just put enough montiors on your kids, therefore SIDS deaths that do occur are the parents’ fault? Random. Act. Of. Nature. Everyone repeat that. Everything in the world is not the parents’ fault. Sure, if you know your kid has a health problem, monitor away. But don’t treat every healthy kid like a fragile preemie. @AnotherAnon – I am not aware of that conclusion. Given the things that we know are helpful in preventing SIDS, I don’t think the conclusion that all SIDS cases have an underlying problem is true. We know putting babies to sleep on their backs reduces risk. We know breastfeeding reduces risk. There is at least one study I am aware of that shows using a pacifier while sleeping reduces risk. All of these are thought to help because they increase arousal. Babies sleep better on their tummies. Bottle fed babies go longer between feedings, etc. In babies that die of SIDS the thinking (at least when I was in primary care) was that they are so unaroused, so asleep if you will, that the neural pathways in charge of breathing “fall asleep” and they die. The stimulation of a pacifier, or the smaller breast feedings that make you hungrier faster keep babies from falling into that really deep sleep that can be dangerous. It’s really amazing how neurologically immature babies are. The price we pay for having such giant brains. To fit those big heads through a human pelvis, you’ve got to get ’em out only about half baked. Ugh! I can’t imagine a worse product for parents, like us, who’ve had a preemie monitored around the clock in the hospital! We were terrified the day the nurses “unplugged” our son and handed him to us to bring home. Wasn’t it enough that we could finally carry him five feet away from his isolette? Now we had to bring him OUTSIDE?! And IN THE CAR, and HOME, all in one day?! He should still have been in utero for another five weeks! We had grown so used to those alarms. They were all we knew and we felt dependent on them. The only way for us to get over that and learn to trust our baby was to live without them, cold turkey. Poor, poor young mothers. What a Hell too many of them inhabit. I can almost sense the sreaming anguish of people who think they need such a product. What an awful existence. The more you give into that sort of anxiety the worse it gets. The people marketing this stuff should be flogged for contributing to worsening public mental health issues. I know this might sound crazy but….After the first month of using a baby monitor, I tossed it out. I only used it when I was working outside, in the garden, and the babies were sleeping. Otherwise…no need. Id hear them if they cried. As a parent who used a monitor for a month after my kid was out of the NICU, OMG, what a pain!!!! At least this one wouldn’t require lugging around the equivalent of a battery-filled briefcase? Why would I inflict something like that on myself?! And given how many times it went off due to faulty readings/equipment failure, how likely is such a product to work significantly better than the hospital grade equipment we had 6 years ago? Boggling. @Heidi – I agree. We bought a baby monitor for our first, and put it in there. Made the big mistake of actually having it on – we didn’t get a full night’s sleep till she was 18 months. Didn’t use it for the second. I think we still have it – the kids used to try to trick the cats using it making bird noises through it. This is insanity. When my middle daughter was in the NICU (for a suspected seizure at birth — nothing came of it), I was always taking her off all those monitors in favor of simply holding her skin-to-skin. (The hospital staff only requested she be on the monitors if I wasn’t in the room.) When I got my babies home, I kept them all close, even while sleeping. Seems like yet another “buy this or your baby will DIE” products. Fear sells. knowing how many heartbeats per minute…isnt that something that belongs in a trivia book of random facts? cause, seriously. my brother died of SIDS. my parents subsequently used a heartbeat monitor for peace of mind. there is a time and a place. however as a general principle, yes, this is ridiculous. When my daughters were babies they slept in our room, their bed beside ours. First I didn’t have to get up to breastfeed them, second we could easily check if they breathed and everything else was fine. But I had many online discussions with other mothers who absolutely needed this Angelcare thing and I read many posts like “we had three alarms this night, I’m so afraid! !” (Of course the baby was alright) I never heard of any case in which it was really useful in a critical situation. The geek in me loves this product! Despite what others are saying, I would want to know if my baby’s heart or breathing stopped in the night. You wouldn’t want that little window of opportunity to revive him or give him CPR until the ambulance got there? You’d rather not know? I assume that the thing is configurable, and you can set it to only notify you in case of emergency events – heart stopped, breathing stopped, high fever, tonic-clonic seizure, etc. – and not just the fact that he was awake and moving around or had a change in mood/behaviour. I don’t think there is anything here to prevent you from cosleeping, or sleeping with the child in a different room, whatever your preference is. No reason why any of that would need to change. You’d just have more data! OMG. This is crazy. We may as well chip everyone so we can monitor each other. I wanted to sleep as much as I could during the night. As far as vitals, they naturally vary all the time, every second. I had a very ill daughter requiring monitors and such, but it was medical equipment provided by an agency. I would never put clothing like that on a child with health problems. Healthy children do not need that. Kids who are ill would need actual medical equipment or need to be in the hospital. 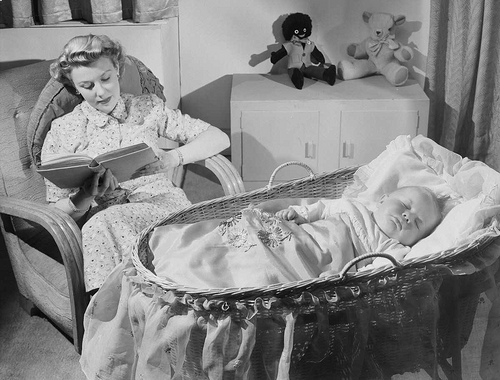 If a parent is that worried, put the bassinet in the room with you. My husband’s a geek and thinks this sounds awesome. He wants one in his size, set to harass my phone constantly while I’m at work. For a healthy baby though? Stupid waste of money. To everybody dismissing the use of video baby monitors: Useless the first few months, since baby doesn’t move enough to be perceptible on the low resolution screens, but later it was pretty cool. We could see if she wanted to get up or was happy playing in her crib, rather than A) checking in at every sound, or B) waiting until the blood curdling screams every time. Plus you see some hilarious things babies/toddlers do when they think no one’s watching. This is what happens when experts tell you it’s dangerous to do what’s instinctive and natural–sleep next to your baby. Sorry if I offend anybody who hates cosleeping (I know there are people who can’t sleep that way, which I totally understand, believe me! ), but it’s the biological norm for humans (look at cross-cultural and historical data and this becomes obvious). So yeah, mothers of newborns want to know everything their baby is doing every single second. They worry whether their baby is still breathing. That’s normal and instinctive, because your hormones and instinct are designed to urge you to stay close to your baby. And babies cry when you put them down, because they want to sleep with you. So how about instead of telling parents that what comes naturally is dangerous and bad and then creating products like this to make up for the need that they naturally have to monitor their babies, let’s encourage the normal way of monitoring babies–by being next to them, looking at them, and touching them. Just because technology makes some things possible doesn’t mean one should do it. Heidi S, gardening is a great time to use a baby monitor. Ours were born when we lived in 500 sq feet and 800 sq feet. The baby couldn’t hardly fart without us hearing it when we were inside. I don’t need a message to my cell phone though. After a while I would just ignore it. Our first child was born with a heart condition. She spent her first 2 weeks of life hooked up to heart/pulse monitors. After that, her cardiologist told us that as long as we gave her her medication, 99.9% chance she would be FINE. He gave us a stethoscope, because he said that many other parents in our situation like to monitor baby’s heartrate daily (though I suspect they would actually check more like every hour on the hour), though he mentioned that was optional, and that as long as she was acting normal, not to worry. Guess what – we used the stethoscope maybe twice in a year. She slept in her own room right away, and I never went in at night “just to make sure she’s breathing” (she’s a light sleeper, didn’t want to risk waking her). After a year she went off her meds, I have pretty much forgotten the whole thing ever happened, and at almost 3 she now uses the stethoscope daily – as a TOY. lol. I’m just trying to say, even when you have a “reason” to be paranoid, that doesn’t mean it’s good or helpful to be. I’m so glad we were able to be relaxed parents and really enjoy her first year of life, instead of it being overshadowed by fear and constant, sleepless vigilance. As the parent of a special needs child, i can see the value in this. My son frequently quit breathing while he was sleeping until he was about 6 months old. I was afraid to ever be out of sight of him, let alone actually sleep myself. I can’t imagine using it for a normally developing child though. For a moment there, (after reading just the title), I had to think if I WAS supposed to know how many bpm LO has. 🙂 Anyhow, I remember being shown a onesie with a sensor that will change color if your baby has a fever, and I walked away from it, thinking, “What nonsense!” And now Exmobaby just took it ten steps further. Kiesha had it on the dot: robot mama indeed. I think in teenagers language, this is called “TMI” = too much information, which is totally unnecessary. When we start to “gadgetize” love and care, you just gotta wonder. Because somehow something I throw into the washing machine is going to be accurate? Safe? Nope. On one hand this is interesting, the things people come up with! I worried more than usual with my second daughter. She was born with reflux and would stop breathing at times. I’d have to turn her to face the floor and pat her back to get her to breathe again. I was worried it might happen in her sleep. I kept her elevated. I’d wake to check her every and now and then. She was fine. Somehow she survived without me monitoring her vitals 24/7. This is more fuel to the fire of paranoia and more of us keeping our kids from having any freedom. I only recently have started using my baby monitor. If I am sleeping downstairs, cause of my husband’s snoring, and want to make sure I hear when my now-9 month old wakes up. Or when i have my girls playing in their room while I am cleaning and I want to make sure my 2 yr old is being nice to her sister. I don’t need to sit there and watch or have a video monitor. I know what it sounds like when they are not behaving and when it gets quiet for too long I check and most times they are playing nicely or have passed out on the floor. I know some women who would think me horrible, but I have better things to do than stress over non-existant problems. Like whether my kids heartrates are what they should be or what exactly they do in their room when I am not there. As long as their heart is still beating and they’re not fighting or breaking something in their room I’m good. Anything else is extra useless info that would distract me from more important things. Like relaxing, playing with my kids, enjoying them while they are young, giving them lots of hugs and kisses and tickles, etc. I feel bad for the paranoid moms out there. I’ve had my share of it, especially when I was a first time mom. But I got over it. Kids aren’t as fragile and weak as this new scare tactic society wants us to believe. An average healthy baby or toddler doesn’t need monitored all the time. They need love, attention, and relaxed parents to teach them not to grow up to be paranoid worrywarts. I do think this would get pretty old, pretty fast. Newborns have apnea all the time and get worked up and screaming because of gas and whatnot. I’m sure this thing gets tossed out after a few nights. But I have to defend my beloved video monitor here! We never used the audio monitor, but then my husband (the tech geek) found a great deal on a video monitor and it’s the Best. Thing. Ever. My daughter sometimes screams in her sleep, and before we had this monitor we would rush in to check on her. Now we can peek on the monitor and see that she’s actually still asleep, or falling asleep, or being a little monkey and playing in her crib. Now we dont have to run in there to check, and shes learned how to self-soothe. It’s proven invaluable. I went to a baby shower where the new mommy (who was in her late 30s, by the way) got one of those “timers” which can tell you how long ago baby was fed (and from which side), changed, burped and napped. Everyone with kids scoffed at it and said, we had one of those, it was called THE BABY! Yes, there are times for a baby to be monitored constantly. We have medical equipment for those times. And should a baby have electronic wiring that close to developing brains/bodies at all times? Doesn’t sound developmentally safe to me. Y’know, I do think this is a great invention with a time and place–like for babies with medical conditions severe enough to the point where it’s a good idea to monitor their vitals. So now there is no longer a difference between a sick kid and an unhealthy kid? Products like these hinder a parent’s development of common sense and judgement. Personally, I trust myself more than I do some stupid machine (and most “experts”) to tell me what my kid needs. Actually, I trust my kid most to tell me what she needs. She does something called crying. It gets my attention better than a text. I agree to the usefulness of this product for kids with medical conditions, but I imagine that is something the hospital can suggest when necessary. This doesn’t really need to be a mass marketed product. I looked at the link and couldn’t believe how much the system costs. One thousand dollars (or $2500 for the deluxe set) can buy a lot of clothing, diapers, food and toys. Call me a cheapskate, but I couldn’t imagine spending that sort of money to monitor a healthy baby’s vital signs. I’d rather spend that amount of money on a nice vacation. This product would be good for a baby with a medical condition that requires constant monitoring. But I wouldn’t waste my money buying it for a healthy baby. A book that I’m currently reading reminds me of the climate of fear in parenting. It’s called “Manufacturing Hysteria” by Jay Feldman. It starts with the anti-German hysteria in the US during World War I and goes up to just after 9/11. I’m up to the fear of the “Bolshevik menace” of the early 1920s. Feldman describes the mechanisms for how fear is spread and says that it’s very easy for mass hysteria to take over the population. Remember, most of the time periods in this book are in the days before TV and 24-hour news. Even back then there were ways to scare the population (mostly through the yellow press). He also talks about “lone voices in the wilderness” who tried to convince people that their fear was irrational. His writing style is on the dry side, but the incidents that he describes are interesting. I see parallels with today. Back during WWI people were encouraged to turn in their neighbors for anti-American statements or for being draft dodgers. 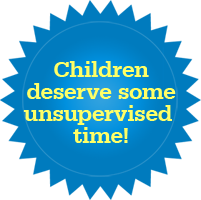 Those of us who go against the current norm of helicopter parenting are turned in to CPS by their neighbors for child endangerment. Those of us in the free range movement also have a voice of reason with Lenore. I’m assuming you’ve seen the story in Ohio about a Mickey Mouse lock-down? Great! So now instead of daycare or a sitter, I can just leave my baby at home… right? Because I’m really not sure what “constant monitoring” means besides that. Honestly, it sounds more like a pay-money-to-not-have-to-actually-pay-attention-or-think device, which our culture loves. When I looked at the link for this product, I honestly thought it was so you could monitor your baby’s vitals while they were in daycare. And then I thought, why on Earth would you want to do that? I had a hard enough time working when my infant was in daycare (couldn’t get her off my mind! ), I would have been non-functional if I’d gotten text updates about her condition! Now I understand it’s for babies at home? Huh, no, don’t need it, all 3 of mine barely slept til they were 2. I knew what they were up to all night long……. I actually laughed when I read this !!!! When my son was born 22 years ago, baby monitors were the “big thing” and everyone had to have one. When I went outside how was I supposed to hear him cry? Guess what, I didn’t until I came back into the house (usually from hanging my clothes out on the clothesline) Horror of horrors !!!! I had friends ask me how I managed without one. Well, my answer to that was the same way millions upon millions of mothers before me without one did…. Gee !!!! I can’t even imagine this being necessary. Unless you have a child with health issues that requires these things to be monitored, what a useless gadget. I shake my head folks. I remember worrying that my daughter would stop breathing while I slept for the first few days she existed. Then the sleep deprivation took over and I got over it. I think the initial feeling is normal. But you’d never get over the worry if you had a monitor. I can tell from the ridiculous price tag that they are really interested in saving babies. I received a baby monitor at my baby shower. This was over 10 years ago, and it was not a digital one. We picked up the “cross signals” of our neighbor’s monitor (they were co-sleepers with their babies.) We didn’t know them well, but had the impression that they were quite religious and proper. Well, that was NOT what we heard on the monitor in their bedroom! At first we laughed so hard, but then got super paranoid that they heard US, too. No more monitor. After the birth of my second child, my MIL gave us a video baby monitor. I set it up briefly but was honestly too busy chasing a toddler to view it much. I decided to us it instead in the basement playroom I had set up for my 2 yo. After two days, I noticed it turned toward the wall. Sure enough, he had used a barstool to stand on and swivel the camera to face away from the action and show just the wall. I asked him why he did such a thing, and he said he didn’t like me spying on him when he was just trying to play. We sold it at a garage sale that spring. I got a baby monitor at my shower, and I gave it an honest try. I shut it off after maybe 3 days because the static was keeping me awake. And my kids needed me to get my sleep, more than anything else. Granted, they were not newborns when I took custody. My kids were always great sleepers. Or could it be that I was a great sleeper and they just had to deal? LOL. They’ll understand when they have children. I wouldn’t touch this one, and I do have a family history of SIDS – my older sister, though, not one of my kids. I hovered over my first for months, and I semi-hover over my second. But not to this degree – if I need this kind of monitoring I want medical-grade equipment, and if I don’t, then I don’t want any. My daughter is on a monitor for her heartrate and oxygen saturation and it is completely unreliable once she’s awake and moving. I’m pretty doubtful this device would do anything more than terrify new parents initially and then desensitize them to ACTUAL warning signs. So ridiculous. Welcome to the dystopian future! So crazy. Anyone who has ever had a baby in the NICU knows how often you get false alarms with that equipment. Parents of newborns are already sleep deprived enough without this. I bet my sister’s ex-daycare provider is going to get this. The daycare owner had been taking care of my niece, and a few other kids about 2-3 years old. When my sister had her youngest, the daycare owner said she could take him too. It was only about 5 hours a day, my sister said yes. It went well at first, then my nephew started coming home with pooped diapers and a bad rash. It turned out that my sister brought the boy in in the morning, asleep usually in the car seat, and the daycare provider put him in a spare room so he could sleep. He spent the whole time there, strapped in the seat because in reality, she couldn’t handle a bunch of 2-3 year olds and an infant. He spent most of his first year alone in a room while my sister worked. When my sister found out she threw a fit and withdrew both kids. Then she found a grandma who was watching her granddaughter and took her son there. They went on walks in the woods, went to the playground and had a grand time. My niece went to a preschool. While I am sure that products like this can be used properly (maybe) I see a markets for caregivers who want this product so they don’t have to work and pay attention to the kids in their care. This device could have potential as a weaning device…for overprotective parents. It’s perfectly okay to put a baby down to sleep and do something else in another room, but the nascent helicopter parent thinks “No, I mustn’t leave the baby for a second, because what if what if what if?” With this device they could break free a bit. It’d be kind of like a nicotine patch: not recommended for everyone, but healthier than the alternative for some. This is the dumbest thing I have heard of to date! Makes my sarcastic side wonder: What if my baby’s clothes run out of batteries, or is it powered by her breathing? What if I decide to hold her? Will my heartbeat set off an alarm? What a load of crap and mixed messages! Hold your baby! Sleep near it! Best decisions I ever made! My daughter was a micropreemie. She came home (2 weeks before her due date) with supplemental oxygen as well as an O2 sat & heart rate monitor. And lawd, we hated that thing. It sucked. It made us paranoid. It false-alarmed a jillion times a day. We gave up on it after about 4 weeks; kept the O2, ditched the monitor. Why would anybody submit to that VOLUNTARILY? I agree with many people who have commented previously. This gives parents another reason to ignore their kids. I know parents who spend more time on their phones then with their kids. It’s sad. Unfortunately, I don’t an end to this kind of product.